RB411U is is end of life (EOL). Mikrotik recommends RBM11G for direct replacement. The RB411U is a versatile yet very small device. 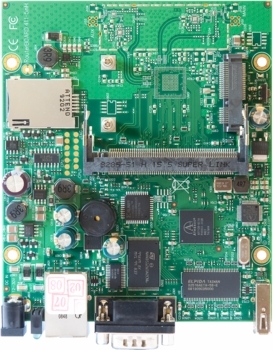 It includes all - a miniPCI slot, a USB 2.0 port and a miniPCI-E slot for connecting a 3G card. A SIM card slot for 3G is also present on the RB411U. RB411U includes RouterOS - the operating system, which can be a router, firewall, bandwidth manager, a mobile 3G router, and more - all at the same time. One small device - with all the power of RouterOS. At a very special price.